I recently picked up some items in Berlin. As soon as I found out that I would be heading to the city, I already mind-shopped NYX products. 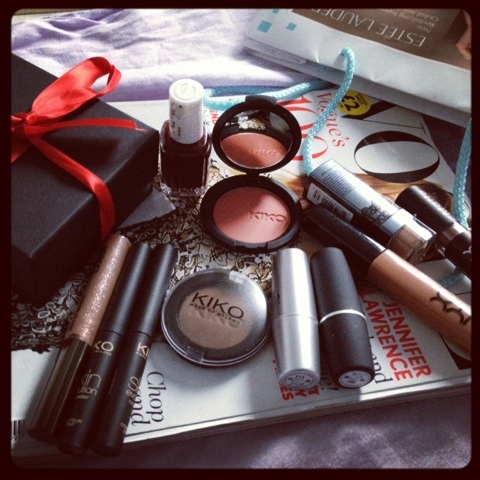 I also went to Kiko and picked up quite a few items. I like that Kiko is affordable yet is good quality. Also, dont you think that this blog is turning/has turned into a beauty blog? Great haul, love evrything u bought u r right abt lancomes 24hr its become a holy grail for me since feb,I love it! Ur blog is wonderful I likey a lot! I'm actually looking for a new foundation because I'm kind of over the MAC Shades. I think NARS will be my next choice but will definitely be looking into Lancome, as well! So jealous I've wanted to try NYX lip products for ages! Great haul! I think you have got great products here. I love the colors and I am interested in trying out these products too. But I guess, one by one. Hey hope you reply to this. What is that Kiko blush I see called? Great haul.